Ian Paisley should not face any further punishment for breaching parliamentary rules, a fellow DUP MP has said. 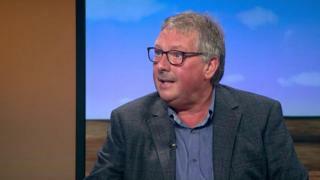 Sammy Wilson told BBC NI's Sunday Politics that Mr Paisley had been punished "very severely" by the House of Commons and "that should be the end of the matter". Mr Paisley apologised after failing to declare two family holidays in 2013 paid for by the Sri Lankan government. Senior DUP members met on Saturday to discuss his future. The outcome of that meeting is not yet known, but the party said it may issue a statement early in the week. Mr Wilson said: "As far as I am concerned Ian Paisley has been punished by the House of Commons. "He has admitted that he did wrong and he has apologised to the party, to parliament and to his constituents for that. "I do not believe there should be any additional sanction imposed on him." How many days do MPs attend Westminster? A parliamentary watchdog has recommended North Antrim MP Mr Paisley be suspended for the Commons for 30 days after he failed to declare the holidays and later lobbied the then prime minister on behalf of Sri Lanka. He could also face a by-election if 10% of the eligible electorate in his constituency signs a petition. East Antrim MP Mr Wilson said if there is a by-election then Mr Paisley "deserves to be a candidate". "I have worked with Ian in the House of Commons, he is a great MP," he said. "The reason he has a massive majority is because people in his constituency know that he works hard for them. "I watch him in the House of Commons, he is one of the most diligent MPs." On Saturday DUP MP for Lagan Valley, Sir Jeffrey Donaldson, told the BBC Mr Paisley's behaviour had been unacceptable but that the party was not going to take "a lynch mob approach". Mr Paisley choked with emotion at times as he apologised in the Commons earlier this week. He has faced calls to stand down over his actions. Party leader Arlene Foster told BBC News NI she had received a personal apology from Mr Paisley for the embarrassment he has caused the DUP. When asked if he had her full support, Mrs Foster said the issue was now a matter for party officers. If suspended, Mr Paisley's absence could deprive Prime Minister Theresa May of a vote on key Brexit issues. The claims about Ian Paisley first appeared in the Daily Telegraph in September 2017.